"Gothic Ghost and Sweet Love Long Denied"
Jonathan Williams is a quiet man, in essence alone with the possible exception of his best friend and house mate, Alayne. When Jonathan inherits Trevaglan Farm from a distant cousin, it is natural that Alayne accompany him to view the property and help him settle in. Jonathan had only visited Trevaglan once, 14 years ago, the same summer he lost his mother. His return conjures both bright memories and dark, and sets in motion a resolution that may cost him Alayne, the man who has come to mean the world to him. He is remembered by the townsfolk, and the residents of the farm, not all of them with fondness. He loved for the first time that long ago summer, and lost that love in circumstances he cannot bear to revisit. Now tokens of the past appear on his windowsill, secret signals only he and his lover knew. But Nat is dead, so who is tormenting Jonathan and endangering Alayne? LOVER'S KNOT is one of the better books I've read. The violent events of the past are painted in harsh colors, truth is not disguised with pretty language, yet the underlying theme of sweet love long denied is what lingers after the last page. Hardy is able to write intensely moving, quietly passionate love scenes, yet also evoke in blistering detail harrowing scenes from the main character's past, neither overshadowing the other, both integral to the beautiful conclusion. It has many elements I like, including a turn of the century British location (Cornwall, 1906), a Gothic ghost story and deeply felt, passionate love. In tone, it reminds me of the way I felt reading Rebecca by Daphne Dumarier for the first time. The same sense of my breath catching in my throat, the feeling of the characters caught up in inevitable conflict and of the past being revealed page by page. 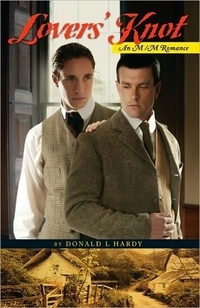 LOVER'S KNOT is Donald L. Hardy's first work of fiction, and a book that will remain dear to my heart. Jonathan Williams has inherited Trevaglan Farm from a distant relative. With his best friend, Alayne, in tow, Jonathan returns to the estate to take possession, meet the current staff, and generally learn what it�s like to live as the landed gentry now. He�d only been there once before, fourteen years earlier. But that was a different time, he�s a different person now, determined to put that experience out of his mind and his heart�. The locals agree that Jonathan is indeed different from the lost young man he was that long ago summer, when he arrived at the farm for a stay after his mother died. Back then the hot summer days were filled with sunshine, the nearby ocean, and a new friend, Nat. Jonathan and the farmhand had quickly grown close, Jonathan needing comfort in the wake of his grief, and Nat basking in the peace and love he didn�t have at home. But that was also a summer of rumors and strange happenings in the surrounding countryside, romantic triangles and wronged lovers. Tempers would flare like a summer lightning storm, and ebb just as quickly. By the summer�s end, one young man was dead, and another haunted for life.